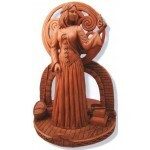 Brigit Celtic Goddess statue by Oberon Zell. 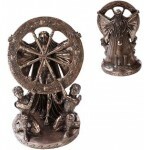 This lovely statue of Brigit is cold cast resin with an antique stone finish and gold accents. She stands 7 1/4 inches tall. She has a flat back. 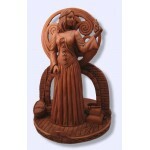 Brigit was the ancient Celtic Sun Goddess. Her worship ranged from Europe to Ireland and Her names were an infinite variation: Bridget, Bride, Brigantia, etc. She was an extremely ubiquitous goddess and She ruled over many important spheres of human endeavor. As goddess of fire, She ruled over both the hearth and the forge. She was a goddess of domestic arts such as housekeeping, weaving, broom-making, bread baking, marriage, and childbirth. As the Lady of the Forge, She was primarily a goldsmith, but Her industrial arts made Her a favorite of blacksmiths' wives, craftswomen, merchants, and factory women. She ruled the powers of inspiration as well, so Her influence was over the Arts as well as Crafts. She inspired poets, writers, and musicians; and She was especially the Patroness (or Matron) of Bardcraft as well as Smithcraft. Brigit was a healer as well as midwife, and She controlled the powers of Water as well as the powers of Fire. Her sacred wells and springs bore Her dedication in the form of bright ribbons hung on nearby trees and bushes. Her influence extended to the health of the trees themselves and animals as well. Apple, rowen, birch and willow were among Her favorites, as cows and sheep were also under Her protection. Item Number: MT-BS | Approximate Size (Inches): 3.00 wide x 2.00 deep x 7.25 high | Approximate Shipping Weight: 1.50 lbs.